Expensive to maintain and operate, the Merz facility held its own until the 1950s. Deterioration followed as city appropriations dwindled, private donations dried up and public interest waned. There were a few bright moments (including the 1956 arrival of the first endangered whooping crane hatched in a zoo), but times were mostly bad. Blasted by the media as an animal “ghetto” in 1958 and urged to “clean up or close up” by the U.S. Humane Society in 1970, the Zoo—now called Audubon Zoo—begged recovery. Recovery finally came through the efforts of devoted community volunteers, and a remarkable public/private collaboration through the Audubon Commission. 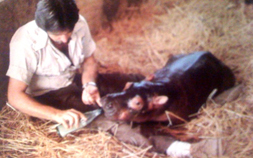 In 1972 the Commission spearheaded passage of a special referendum which generated nearly $2 million in bonds to finance the beginning of the Zoo’s restoration. The volunteers formally rallied as Friends of the Zoo, and in 1973, Ron Forman—the City Hall Liaison for Audubon Park—came on board with a grand vision that evolved into a new master plan for the Zoo. Forman and the Audubon Commission expanded the Zoo to its current 58 acres, allowing for sweeping natural habitats that mirrored wild environments: the African Savanna, North American Grasslands and the South American Pampas. Other new adventures included a Children’s Zoo and a World of Primates exhibit.